This Old Cantilever Train Signal in Needles, California, was dedicated on Pi Day 2015 (i.e. 14 March 2015). 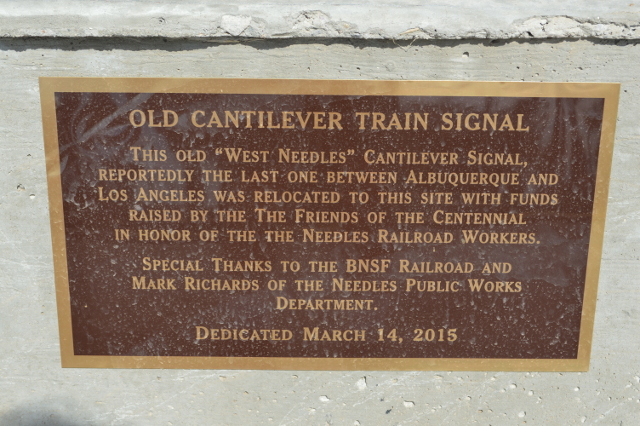 According to City of Needles Mayor Edward T. Paget, Burlington Northern Santa Fe railroad donated the old railroad cantilever signal in early 2013, the Friends of the Needles Centennial raised money for the moving and placement project, and the City of Needles Public Works Department Crew Members removed the old railroad cantilever signal from its railroad side location on the west end of Needles, California in the spring of 2013.